You might have thought that the “honeymoon phase” of marriage was just some made up nonsense, but it turns out it’s real! Humans have known about it since biblical times. In ancient Israel, the army would not conscript men for the first year of their marriage because of it. 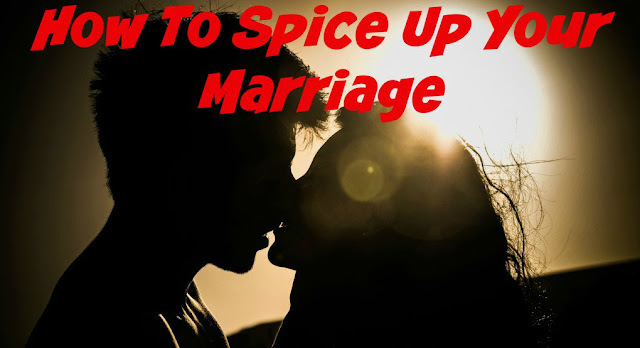 Depending on the individuals involved, the honeymoon stage can last for between six months and two years after the couple have said: “I do.” When it ends, most of us will begin to ask that age-old question of how do we put the spice back into our marriages? There is no shame in that because it is something that virtually every couple ponders at some point in married life. If it’s happening to you at the minute, then read on for these eight fun ways to spice up your marriage. The demands of having kids to look after and jobs to hold down can severely impact on our ability to socialize. As a result, some of us will spend that limited free time seeing our friends as opposed to our partners. After all, we live with and see our partners everyday whereas we only get to see our close friends once every couple of weeks. Living together isn’t socializing though. Spending time with your partner sat in front of the television watching late night talk shows isn’t what you need. If you want to spice up your marriage, head out for a night on the town together or meet up for a lunch date during the week. Proper time with your partner spent socializing, laughing and loving, away from the monotony of the house and daily routine will soon spice up your marriage. Nothing douses water on the flames of a marriage like moaning. We’ve all got complaints about work, carpooling or the kids but does your partner really need to bear the brunt of your frustrations on that front? No is the answer. Sure, you might want to talk about the day you’ve had but leave the complaints at the door by changing the record. You could start by telling your partner one of America’s funniest jokes to get them laughing or talk about an upcoming birthday or vacation. Discussing something positive can be a great start to lifting the mood in your marriage. In 2017, the average American spent 86 hours a month on their smartphone. Just imagine what you could do to spice up your marriage if you spent even half of that time with your partner instead! Turn one night a week into a technology-free evening. Shutdown the smartphone and flick off Facebook to spend some quality time with each other. By giving each other your undivided attention away from the distractions of modern-day life, you can talk, listen and look into each other’s eyes for hours – and who knows where that eye contact might lead? All newlyweds know that a night of passion can do wonders for your well-being and relationship. That is something that, for one reason or another, we can forget as our marriage goes on. Reigniting that passion will help to spice up your marriage and it can have other unintended benefits, such as helping you to sleep more soundly and relieving stress, which are both problems that can place a strain on a marriage. If the physical aspect of your relationship dropped off because of problems in the bedroom, then that’s nothing to be embarrassed about. Over 50% of men will suffer from erectile dysfunction in their lifetime. eDrugSearch can help with the issue and help to spice up your marriage. Married life can be one of routine, and that can lead to feelings of boredom. If you always know that Friday night is movie night, the prospect of going to the cinema can lose its excitement. Throw away the micromanaging of every aspect of your life and go with the flow. If a movie that you like the look of catches your eye at 6 pm on a Monday, go and see it at 7 pm. If there’s no food in the house, then forget that you are only meant to eat out on a Saturday and head out to a swanky restaurant for dinner. When you’ve finished dinner, you could be truly naughty and go on for a drink afterwards. Being spontaneous creates excitement and excitement will spice up your marriage. Don’t let your partner know you are doing this, but spend an entire day saying “Yes” to whatever they want. Not only will it make them happier to be doing the things that they want to be doing, but it should also make you happier knowing that you are doing everything in your power to please them. Happy people make for a spicier relationship! When couples first get hitched, showering each other with love and appreciation was a given. If your partner took on one of the most boring household chores, chances are you’d thank them and truly appreciate the fact that you didn’t have to do it. With the passage of time, however, we can begin to take for granted that they’re out there cutting the grass again or cleaning the oven. Showing appreciation for what your partner does with a simple “thank you” will make them feel rewarded and happier. If you are wanting to rekindle the love and passion that was there when you first got married, then what better way than reminding yourself of the day it happened? Dig out all those photos and videos of the day and talk through what you thought and felt with your partner. A trip down memory lane will help you to remember how spicy your marriage was in the beginning and it can help you rediscover why you fell in love in the first place. You won’t find those sorts of feelings or special memories anywhere else!